Tender, light, easy as pie to make...and eat. Seems plain... Everyone had seconds and thirds. Finished in one sitting. Image from BBC Good Food. Using electric whisk, whisk butter into dry ingredients. Mix wet ingredients together and add slowly. Beating all the time. Pour into lined tin. Cook till golden on top and cooked through. Cool thoroughly before icing. To make icing beat icing sugar and butter. Carefully mix in cream cheese, do not overmix. 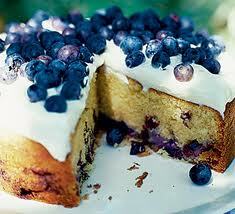 Decorate with remaining blueberries.